TYPE : Sumikago (Basket for charcoal of tea ceremony.). This is made very well and is a wonderful weaving work. It's fine. And this has a very good taste. The work and the form are appropriate Chinese weaving ware. 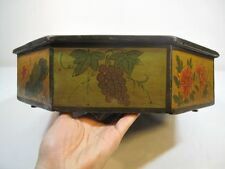 8-1/2" x 6" x 5" Antique Chinese Oval Tea Basket in excellent condition. 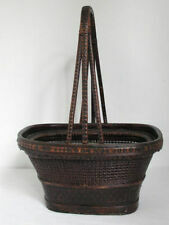 ANTIQUE CHINESE WOVEN 2-PC COVERED BASKET. THE TOP AND BOTTOM OF THIS BASKET ARE NEARLY EQUAL IN SIZE. 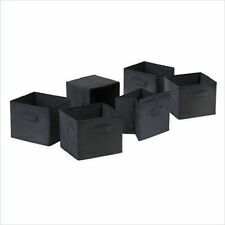 THIS ALLOWS EACH TO BE USED AS SEPARATE BASKETS OR ONE COVERED BASKET. IT IS IN EXCELLENT CONDITION. A beautiful, charming wedding basket. The lid lifts off and is beautifully crafted to fit snugly into place with a dove tailjoint.The basket is bound with 2 brass bands and is made of sections of wood. ESTATE TREASURE. SMALL AREAS OF LOSS (SEE CLOSE-UP PHOTOS) DO NOT DETRACT. DISPLAYS BEAUTIFULLY. JUST A RARE ESTATE FIND!I'LL LOOK FORWARD TO HEARING FROM YOU ! Doing that is against U.S. and international laws. In great condition. From a high-end LA estate. Lots of great deals! I took these photos with my cellphone. Original photos, no retouch in any way. ANTIQUE PENDENT. IN JADE JADEITE. HAND CARVED. WITH NECKLACE NEW MADE IN HARD WOOD. Straw colour herringbone weave. Makes an interesting storage option. These are hand-made and no two are alike. They make a beautiful centerpiece. Size : The bowl is 10 1/2" wide x 4 1/4" high; the under plate is 10 3/4" long. 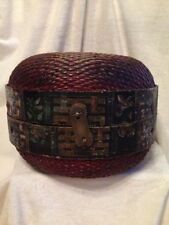 Antique Chinese Basket. Fresh from a local estate, this willow/reed basket is a classic chinese style and weaving technique. Used until the wooden handle is worn smooth and shiny, it's in sturdy condition with wear to one of the leather pieces on one handle. IN JADE JADEITE. HAND CARVED. ANTIQUE LITTLE PLAQUE. 6.25” rim, 4” bottom. 4.5” tall. Good condition, could use some clean up. There is light wear, but great condition and very sturdy. No reserve... I pack items very well and will mail it first class or priority. I do not ship media mail ... only books upon request. Any reasonable offers will be considered. Combined shipping available, please see photos for details and let me know if you have any questions before bidding. 30 day returns on this item. Thanks for bidding! 9.25” rim, 5.5” bottom. 8” tall. Handles 9.5” tall. Good condition, could use some clean up. There is a red mark on the side and sticky gunk in the bottom. No reserve... I pack items very well and will mail it first class or priority. I do not ship media mail ... only books upon request. Any reasonable offers will be considered. Combined shipping available, please see photos for details and let me know if you have any questions before bidding. 30 day returns on this item. Thanks for bidding! MADE FROM WOVEN WILLOW WITH OVERLAPPING BENDWOOD HANDLE. UNCERTAIN OF EXACT AGE. Very interesting old cricket or insect cage made of bamboo and horn. Maybe used to hold bait while fishing?. Shanghai Handicrafts Label. 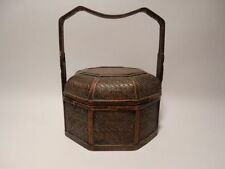 Chinese Wedding Basket with Carved Handles. Woven Bamboo. Single Tier. WEIGHT : 311g. IN PERFECT CONDITION. 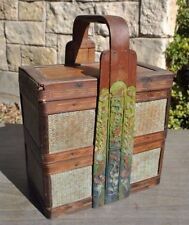 Antique Chinese Wicker Sewing Basket. Good condition. I have been storing this for years. ANTIQUE STATUE BUDDHA GUANYIN IN HARD WOOD. HAND CARVED. 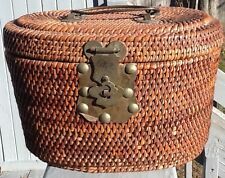 An antique/ vintage Chinese wicker sewing basket. The lid, which has glass ring handle, is also decorated with tassels, coins and beads The basket measures approx 17.5cm in diameter x 6.5cm high. The basket is in good condition: very little wear at all. Circa: 1950s. Lovely oval shaped hand painted 2-tier stacking lidded basket with upright handle. This type of basket is no longer common in China. Main issue is wear to green painted surface of handle rattan supports. Dove Tailed. the worse is on the inside bottom but, doesn't go all the way through. still I think it is in good condition for its age. See all of my photos for details. Will take ordinary logistics. At the here, is the product collect, it is good handwork; the item fully exhibits creativity spirit and brilliant culture. It has refined shapes and distinctive style. This is a beautiful Antique Chinese Wedding Basket. It is made from split bamboo and closely woven Bamboo fiber. Each layer has a wooden base. The walls and top of the box are composed of two separate layers of weaving, which provides strength and rigidity. ANTIQUE BOTTLE VASE POT. IN CHINESE PORCELAIN.